Using Klymit’s patented airframe technology, the new Klymit Spash 25 is a backpack styled dry bag that is completely waterproof and can store gear for hiking, kayaking, canoeing or other outdoor activities where you want to keep your gear dry. the pack weighs 21 ounces and is made from 201 denier nylon and features a typical dry bag roll up top with adjustable straps. When worn as a backpack, the adjustable padded straps and sternum strap provide a good fit, perfect for canyoneering or if you prefer to wear the Spash 25 while canoeing or kayaking. The Klymit Splash 25 also features a daisy chain on the front and is designed to carry up to a 35 lbs. load. 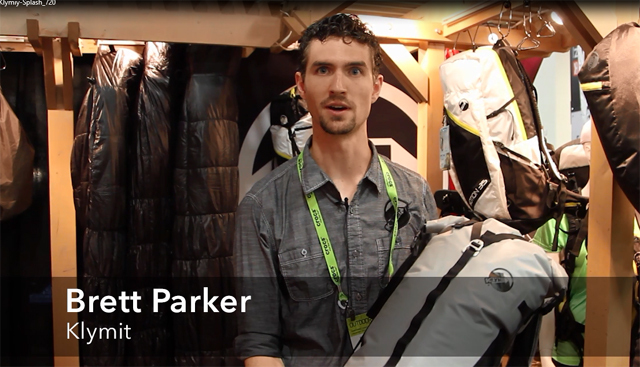 During the 2015 Outdoor Retailer show, we caught up with Klymit’s Brett Parker, who explained the details and features of the Splash 25. For additional information on this and more of Klymit’s products, visit www.klymit.com.